Lady in her 40s-50s, in full proselytism. 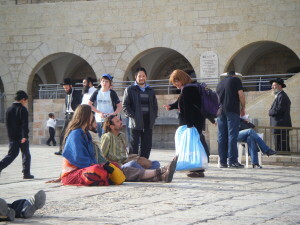 She accosted us on the esplanade leading to the Wailing Wall. As for the political issue, the only way to real peace is through the Noah’s Seven Laws. There will never be peace with the Palestinians. There are all kinds of (Jewish) groups : all say that if one group made peace (with the Palestinians), the other groups are not obliged to follow... The Jewish people are the Chosen People and the Holy Beloved people of God, and God is going to resurrect all the bad and evil peole that did bad things to the Jewish people and He is going to punish them... We are all waiting for God’s punishment for all those who touched the bottom eye of God when they did bad things to the Jewish people. Long live our Messiah !…"
This is the government’s fault, it is not strong enough : our government lets the terrorists stay at hostels and enjoy life but it puts people who want to protect their life in prison for 7 years. The father of this child who was hit on the head and has now to be operated on has been sitting in prison for already 7 years now, just because he wanted to protect his life, that of his family and of the whole settlement. Because of that he is sitting in jail and is not allowed to see his wife nor his family. This is not fair…. Young Jewish hippy in his early 30s, met on the same place, on the same day. What do you think about what she said ? Even if we disagree on things, it is OK, we can disagree on things and still love each other. We sort of discreetly observed you while the woman was speaking to you. We just listened to her, and when she had finished, we said thank you, but we saw you were discussing. What were you trying to do? Tell her that you disagreed or...? "You remember I spoke with you : please, let the Jews go out of Egypt !... OK?... In 8 days, the Jews must sit and celebrate the fact that God led them out of Egypt 3300 years ago, OK ?… You will force him to sit down and eat matza and drink 4 cups of wine… OK ?… Because he is a Jew !… He is different!…. " in fact "tear a limb"